TPG Capital LP and Tarpon Investimentos SA (TRPN3) are among private-equity firms turning to the public markets for new investments in Brazil after prices on closely held companies doubled. Private Brazilian businesses have surged in value in the past two years as international investors pour money into one of the world’s fastest growing major economies. Public markets have gone in the opposite direction, with the Brazil stock exchange falling 18 percent in 2011 as economic growth in the second half of the year slowed more than analysts estimated. “We see better opportunities in the stock exchange,” said Fernando Shayer, managing partner at Tarpon (TRPN3), a Sao Paulo-based private-equity firm. “Prices on private deals have increased too much in the pressure of competition,” he said, yet private- equity firms have to invest in Brazil “no matter what” because clients are demanding it as opportunities elsewhere dry up. The World Bank said last month that Brazil’s economy will probably expand 3.4 percent this year, compared with a 0.3 percent contraction for the euro region and a 2 percent expansion in the U.S. Private-equity firms including the Washington-based Carlyle Group LP and TPG Capital, based in Fort Worth, Texas, are opening offices in Brazil to take advantage, driving up prices. 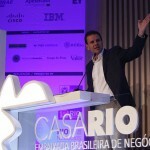 Closely held mid-sized companies in Brazil can be bought for about 10 to 14 times earnings before interest, taxes, depreciation and amortization, or Ebitda, said Todd Crider, co- head of the Sao Paulo office of Simpson Thacher & Bartlett LLP, a law firm that represents private-equity companies. The figure had been about six or seven times Ebitda, Crider said. Bovespa (IBOV), Brazil’s benchmark equity index, ended 2011 trading at 5.32 times its members’ Ebitda, after the gauge of 70 stocks fell on concern the European debt crisis would slow economic growth. The ratio compares with 5.96 times for Mexico’s IPC and 6.99 times for China’s Shanghai Composite Index. Private-equity firms have about $9 billion to $10 billion to invest in Brazil through dedicated funds in the next two to four years, according to Peter de Svastich, general managing partner at Global Emerging Markets Group in Brazil. “There aren’t enough good private projects for all this private-equity money that needs to be invested in Brazil,” de Svastich said. Global Emerging Markets used to be one of the few providers of capital on deals for companies with annual sales of less than $500 million. Now, a threshold of about $150 million can attract several potential buyers, he said. The diverging trends in Brazil’s public and private markets were part of Tarpon’s motivation in boosting its investment in Gerdau SA (GGBR4), the Porto Alegre, Brazil-based steelmaker whose shares fell 22 percent in 2010 and 36 percent in 2011. Tarpon increased its stake in Gerdau’s non-voting shares from 10 percent in August 2011 to 15 percent on Jan. 4, according to a regulatory filing. Warburg Pincus LLC, Hamilton Lane Advisors LLC, Actis LLP, TPG Capital, 3i Group Plc and Carlyle are among firms that opened offices in Brazil since 2008. Blackstone acquired a 40 percent stake in Patria Investimentos, a Brazilian private- equity and asset-management company, in September 2010, while JPMorgan Chase & Co.’s Highbridge Capital Management unit bought Gavea Investimentos Ltda’s private-equity business in October of that year. KKR & Co., the New York-based private-equity firm run by Henry Kravis and George Roberts, has been seeking to hire a senior executive in Brazil since the beginning of last year and plans to open an office in Sao Paulo, according to a person familiar with the matter. A spokesman for KKR in New York declined to comment on Brazil. Bain Capital LLC, the Boston private-equity company co- founded by U.S. Republican presidential candidate Mitt Romney, and Apollo Global Management LLC also have been looking for opportunities in Brazil, said the person, who asked not to be identified because the discussions are private. Silver Lake Management LLC, based in Menlo Park, California, purchased a minority stake in Locaweb Servicos de Internet SA, a website- hosting provider based in Sao Paulo, in September 2010. Advent, which acquired a 50 percent stake in Terminal de Conteineres de Paranagua SA in January 2011 in its biggest deal in Brazil, has about $3 billion to invest in the country, said Patrice Etlin, managing partner for Latin America at the firm’s Sao Paulo office. “Advent has been in the region since 1996 and never left,” he said. Carlyle, which has a stake in CVC Brasil Operadora & Agencia de Viagens SA, raised $1 billion in June to invest in South American companies with a focus in Brazil. On the public side, Banco BTG Pactual SA, the Brazilian bank owned by billionaire Andre Esteves, offered to buy 1 billion reais of shares in Hypermarcas SA to join a group with a controlling stake in the consumer-goods maker, a person close to the talks said last month. Shares of Hypermarcas are down about 64 percent from a peak of 29.49 reais ($16.84) on Oct. 11, 2010. Others investors, including Brazilian private-equity firm GP Investments Ltd. and TPG, also have approached Hypermarcas about joining the controlling block, the person said. Officials at GP and TPG declined to comment. BTG announced on June 27 it raised $1.6 billion for its first private-equity fund, with investments from global funds, sovereign wealth funds and family trusts. Brazil overtook the U.K. last year to become the world’s sixth-largest economy, according to a survey by London-based Center for Economics and Business Research. The International Monetary Fund expects Brazil to become the world’s fifth-biggest economy by 2016. Brazil added about 38 million people to its middle class from 2001 to 2011, bringing the total to 104 million, according to Data Popular, a Sao Paulo-based research and consulting company. Unemployment fell to a record low of 4.7 percent in December (BZUETOTN), according to the nation’s statistics agency, IBGE. Last month, 3i agreed to purchase a minority stake in cable TV provider Blue Interactive Group for about $55 million, its first transaction in Brazil. “There is no point to look for investments paying four or five times Ebitda, which were more usual in the past,” said Marcelo di Lorenzo, 3i’s managing director for Brazil. “Clearly Brazil has changed.” 3i is planning to make one or two acquisitions in Brazil ranging from $30 million to $100 million this year, he said. Martin Escobari, who was named General Atlantic’s head of investments for Latin America in January, said he doesn’t think the price increases in Brazil are out of control.